1. America (I) pl. 4 (Huntington Library). Notice that the plate is masked at the bottom, so that the last four lines beneath the emerging man (“The stern Bard ceas’d . . . in sick & drear lamentings”) are invisible and that the lowest root of the tree forks five times after it leaves the main root. From time to time new Blakes turn up in surprising ways. A previously unknown poem apparently by Blake was inscribed on a drinking glass which appeared modestly in a sale of glassware at Christie’s in 1981, and a poem about Mrs. Butts signed by Blake along with other Butts family memorabilia was brought to the British Library Department of Manuscripts by a descendant of Mrs. Butts to inquire whether they were of any interest or value. So one must be prepared to find curious things associated with Blake in the most unlikely places and in the most remote parts of the world. And one should, of course, greet them with a judicious blend of enthusiasm and incredulity. 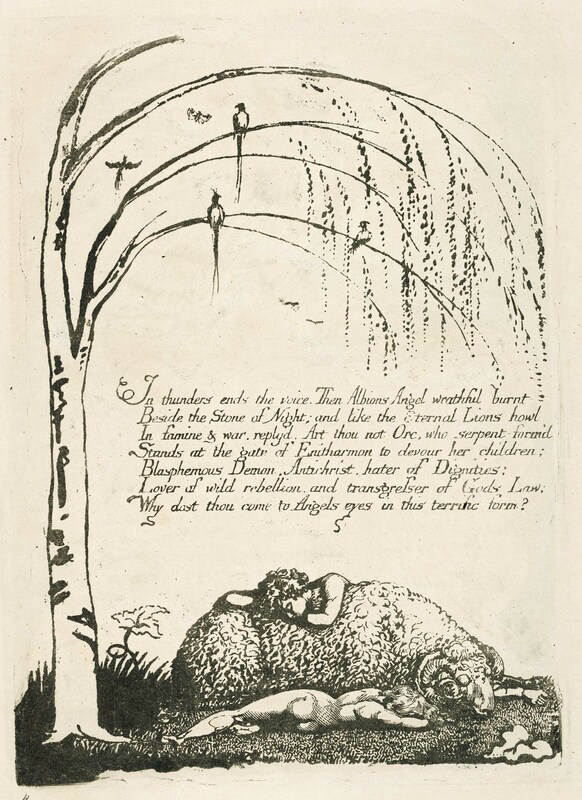 Well, we went over to her house to see this print or drawing, and to my astonishment she produced a huge folder containing twenty-one designs from Blake’s America. They were certainly prints, not drawings, and they looked very good indeed to me (see illus. 3 & 6). Most were on pretty poor paper, but two were colored, and they did not look like any facsimile I had seen. Unfortunately, we planned to leave Toronto next day for fifteen months, and so an extensive examination of them was not possible, but her husband very generously brought the prints to our house that evening, and next morning I got up early in order to have five or six hours to inspect them. HISTORY: (1) Bought from a London bookshop (which one not remembered) in 1963 by (2) An Anonymous Collector. BINDING: The leaves are now loose, between unwatermarked sheets of flimsy tissue, in a white cardboard folder. They are printed on at least three kinds of paper, and they have been gathered in at least three different ways: (1) Most of the leaves (pls. 1-10, 12-17), of very poor quality paper, were stabbed through two holes, about 15.2 cm from the top and 9.5 cm apart; (2) Two of the leaves (pls. 8a, 11a), of much better quality paper, were stabbed through two holes, 14.2 cm from the top and 8.4 cm apart, and could never have been thus stabbed with the first group; (3) And three leaves of the better paper (pls. 10a, 17a, 17b) were never stabbed at all. The edges are deckled, not gilt—and therefore this cannot be the untraced Copy R which was bound in Green morocco with gilt edges. LEAF SIZE: 27.5 to 29.2 cm wide by 38.5 to 40.4 cm high. The poor-quality paper and the good paper leaves show the same variations in size. PLATE SIZES: Most of the plates are within 0.2 cm of the standard size of Blake’s plates (this normal variation being due to such things as shrinking and stretching of damp paper). The only irregularities are in the widths of pls. 1-2 and 11a and the heights of pls. 11a, 15, 17, 17a, and 17b; for instance, pl. 11a is 17.4 × 23.7 cm, whereas the norm is 16.9 × 23.4 cm. PAPER: There are several distinct lots of paper. (1) For most of the plates (pls. 1-10, 12-17), the paper is poor, thin, with holes and almost-holes as manufactured; there are chain-lines 2.8 cm apart, a fleur de lis, and “IV” (or, conceivably, “VI” as seen from the other side, though the extra thickness of the side of the “V” next to the “I” makes “IV” seem more likely). (2) One print (pl. 17a) is on good, heavy paper with chain-lines 2.7 cm apart but no watermark. (3) Pls. 8a, 10a-11a, and 17b are on good quality, heavy paper without chain lines, and in pl. 8a is the watermark J Whatman / 1885. PRINTING COLORS: Dull, flat Green, quite dark—pl. 17b is almost Black—on all the plates but pl. 11, which is a rather heavy Black. 21 LEAVES, printed on one side only: pls. 1-8, 8a, 9-10, 10a, 11-17, 17a, 17b. 2. America pl. 4, facsimile like that in Copy B (Robert N. Essick). Notice that the lowest root of the tree forks only thrice after it leaves the main root. Many of the other apparent differences in this facsimile from Copy I, such as the flourish from the “d” of “despairing” in line 1 and the smudge above “Serpent” in line 12, might be caused by differences in inking, but remark the clear differences in the formation of the initial “e” in “eternal” in the last line and the flourish after “Africa” in line 8. 3. America pl. 4, from the “new” America. Number (Plate): 183 (15)-184 (4), 187 (1), 193 (5), 195 (17), 197 (16), 199 (14)-200 (10)-201 (8), 205 (6)-206 (9)-207 (7). This order corresponds to nothing known to me; in particular, it seems to be unrelated to the similar numbers on the miscellaneous collection of genuine Blake prints including the “Order” of the Songs (see Blake Books , pp. 338-41), which goes only as high as 103. In addition, there is an “A” on pl. 8a and “398” on pl. 2 in pencil, and on pls. 5, 6, 7, 14, 16 there are tiny scraps of paper pasted near the old Brown ink numbers, some of them partly torn off or visible only in offset, with a frame round “Char: II. Cs: XII”. America is not divided into Chapters, and I can make nothing of these notes. OFFSETS: There is no offset from one print to another, indicating the order in which they were arranged, but there are very small fragments of larger printed sheets pasted to the versos of some leaves of poor paper (pls. 6-10, 12-14, 16-17); the printing (e.g., “effect / standard” on pl. 14 verso) is on the under side of the added paper and appears as mirror-writing. pl. 10a) There is smudged Blue watercolor on the sky AND on the cloud at the top behind the man, and there may perhaps be faint Pink on the cloud below the man’s right hand. pl. 11a) Heavy opaque colors, sometimes obscuring the words, color the grass Yellow, the leaves Green, and the baby orangish Pink. There is a shaft of light from the middle at the right slanting towards the bottom of the middle left margin, with a little Blue to the left of the shaft. The opaque coloring has smudged through to the verso. VARIANTS: Some of the plates are rather faint, and all the borders are wiped clean. As is common with Blake’s printing, there is no indentation from the plate. Pl. 1 has a framing line round it and is not well printed. Pl. 2: The top left margin was not wiped clean. Pl. 3 has pl. e printed on it, as in Copies C-L, R.
Pl. 4 is masked at the bottom 0.3 cm below the man’s toe (see illus. 3 here); Copies C-M are also masked (see illus. 1). Pl. 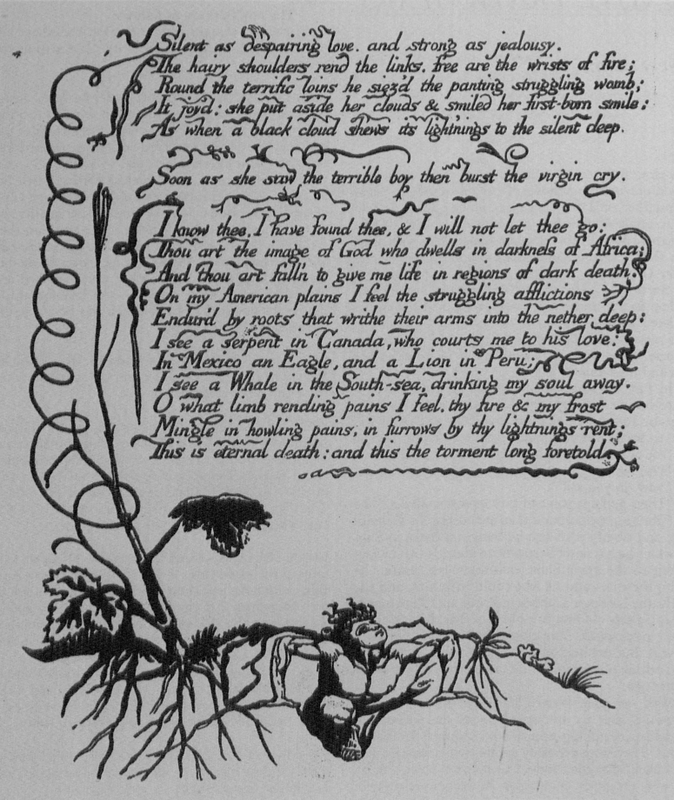 11a: The coloring has made the plants at bottom very different, and the last line of text seems to have been emphasized by hand. Pl. 12: The lines of the man’s eyes are quite clear, not a solid dark mass, as in most copies. Pl. 13: The serpent has one tail, as in Copies A-D, H, M-Q (not three tails as in Copies E-G, J-L). CONCLUSIONS: By breakfast time, I had concluded that this seems to be an excellent photographic facsimile, otherwise unknown, made about 1885 with intent to deceive. When Blake printed his plates, he carefully wiped most of the borders clean of ink, and of course the pattern of wiping is different in each copy. But in the duplicates here, pls. 8 and 8a, 10 and 10a, 17, 17a, and 17b, the borders are identical in a way virtually impossible to achieve manually. Pl. 17b, on whiter paper, shows faint color throughout the “white” areas, implying a photographic original. The watermark of 1885 indicates that at least pl. 8a was printed in or after that year. The exact resemblance of the designs, in every detail I noticed, to undoubted copies of Blake’s originals—cp. illus. 1 and illus. 3, illus. 4 and illus. 6 here—indicates that these facsimiles were made from photographs. The extremely poor quality of the paper used for most of the prints, with irrelevant notes and numbers and scraps of paper on the back, suggests that they were experimental proofs, not intended for sale, and the fact that the coloring was begun only on prints on better quality paper suggests to me that an attempt was being made to deceive—though the coloring is quite different from any by Blake which I have seen. The price of “2/10/-” on pl. 11 may indicate that the prints on better quality paper were designed by the maker for separate sale. If one were trying to identify the original from which this facsimile was made, one should notice (1) that pl. 3 has pl. e with the word “Preludium” printed at the top, as in Copies C-L, R; (2) that pl. 4 (illus. 3 here) is masked, as in Copies C-M, and that it is masked 0.3 cm below the man’s toe, as in Copies C, F, H (0.4 cm), and L (0.4cm); (3) and that the serpent on pl. 13 has one tail, as in Copies A-D, H, M-Q, not three, as in Copies E-G, J-L. The only copies with all these characteristics are C, D, and H, and pl. 4 of Copy D is masked in a different way from this facsimile. Copy H has been in the British Museum Print Room since 1856 and seems to be the most likely candidate. 4. America (I) pl. 9 (Huntington Library). Two of the most curious features of this lovely design are the contrast between the bellicose words and the Edenic scene, and the apparently detached ankle and foot visible to the right of the ram’s head. 5. America pl. 9, facsimile like that in Copy B (Robert N. Essick). Note that the plate lacks the flying birds under the branches. 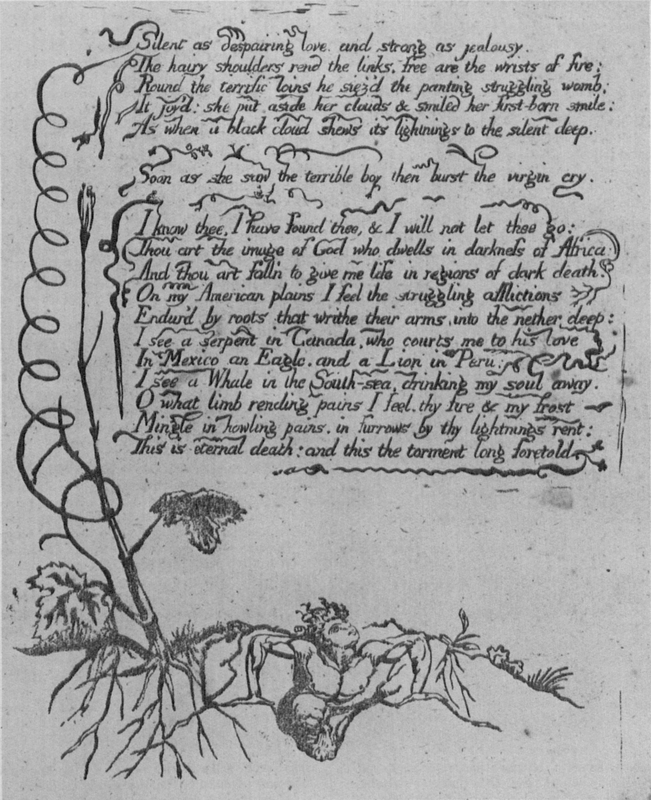 The border was wiped free of ink in a manner different than the print in Copy I, especially at the bottom left, bottom margin, bottom right, and to the right of the tree. The smudges on the top boy’s cheek, the bottom boy’s calf, the leaf at the bottom right, and elsewhere are probably produced merely by over-heavy printing. The differences in the flourish on the “b” of “burnt” (line 1) and the “W” of “Why” (line 7) could have been the result of different inking, but the flourish in the “G” of “Gods” (line 6) is formed differently in the stereotype. 6. America pl. 9 from the “new” America. begin page 44 | ↑ back to top any other known to me, and it is in most respects far harder to distinguish from Blake’s originals than any other facsimile. 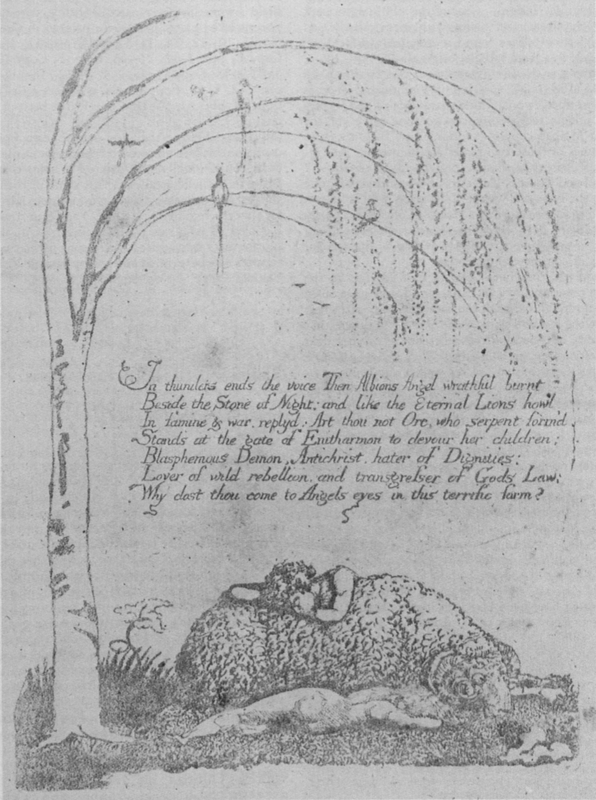 Indeed, without the 1885 watermark and the duplication of plates with identically wiped borders, I should have found it extremely difficult to distinguish this from a Blake original. There is a troubling parallel to this facsimile. In Blake, 16 (1983), 212-23, Joseph Viscomi and Thomas Lange described two facsimile plates (pls. 4 and 9) previously undetected among the genuine plates of the Pierpont Morgan copy of America, Copy B. Only three other copies of those two plates are known, in the collections of Robert N. Essick (pls. 4 and 9—see illus. 2 & 5 here) and Thomas Lange (pl. 9), and Essick’s came through the hands of Walter T. Spencer, who is known to have forged the coloring of America Copy Q and Europe Copy L about 1913. It seems at least possible, then, that pls. 4 and 9 were made for Walter T. Spencer for purposes of commercial deception. However, the “new” America is distinct from the facsimile plates in Copy B. Essick and Lange generously compared reproductions of the “new” America with their copies of the facsimile pls. 4 and 9 and concluded that their prints were made from different stereotypes than the corresponding “new” plates. *↤ * I must depend, with confidence and gratitude, upon the comparisons made by Essick and Lange, for though I have examined in detail the genuine America plates, the “new” prints, and the Morgan-Essick-Lange facsimiles of pls. 4 and 9, I have never been able to examine the “new” plates (or reproductions of them) and the Morgan-Essick-Lange facsimiles together. They believe that the stereotypes for the “new” plates were made from lithographs (stone, rather than zinc) onto which the America outlines were carefully but not flawlessly copied—there are too many minute differences in proportions and in flourishes of letter-forms and tendrils to make photography seem likely. The grainy areas were probably traced with a lithographic crayon and the solid areas with tusche applied with a pen or brush. They also point out that pl. 1 in the “new” America seems to be imitated from the proof in Copy a, with all its unique qualities including the framing-line round the plate, on the backing-mat, of Copy a—and this may have been made photographically. Copy a, however, includes only pls. 1, 4, 11-12, and 15, and consequently the “new” America, which reproduces all the plates save pl. 18, must have been based on models beyond those in Copy a. 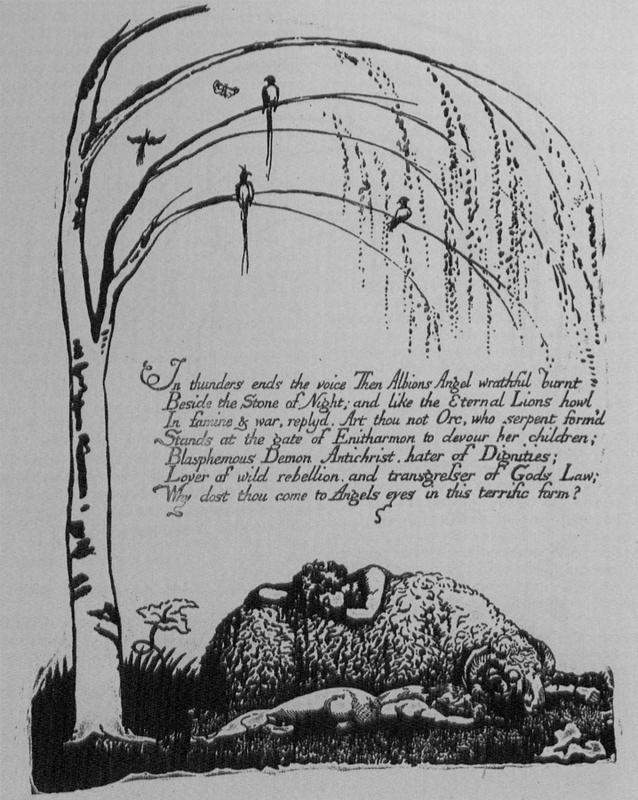 Copy a was in the hands of Quaritch and Muir in 1880, and Muir made facsimiles from other prints which were in the same collection as Copy a (see Blake Books , p. 339). The “new” facsimile seems therefore to be eclectic, choosing plates from at least two different copies. 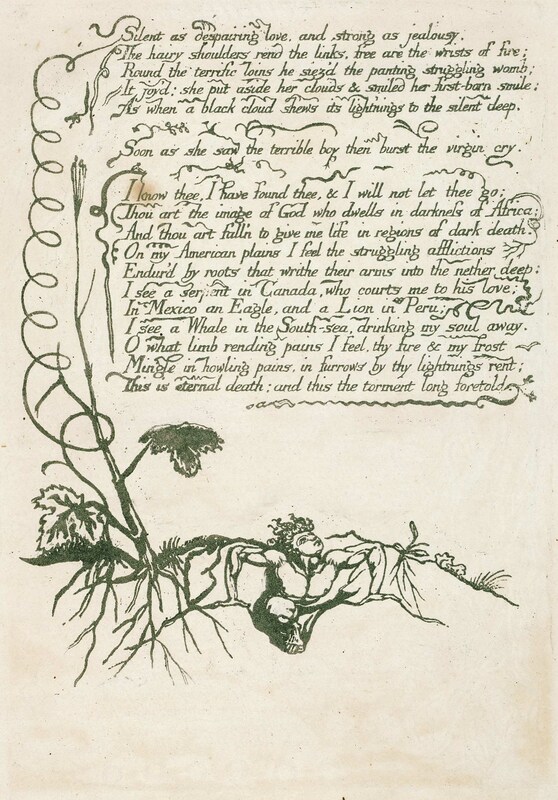 The existence of this excellent facsimile should make us extremely cautious in judging the authenticity of Blake’s works in Illuminated Printing, particularly unwatermarked plates of America printed in Green: Copy C, pls. 10, 12, 14, 15; Copy D, pls. 12, 14, 16, 18; Copy E, pls. 1-12, 15-16; Copy F; Copy G, pls. 2, 5-6, 9-18; Copy I, pls. 1-2, 7-12, 15-18; Copy K, pls. 1-2, 5-18; Copy L (sold as “a facsimile” in 1927); Copy M, pls. 10, 14-16; Copy R (the basis of the Muir facsimile); Copy a, pls. 11-12; pl. 1 (Lister); and pl. 4 (Morgan). Perhaps they too are hitherto unidentified copies of this late nineteenth century facsimile. Perhaps those copies indifferently printed or colored are not by Blake or his wife at all; perhaps some of them are facsimiles so good that they have fooled us all—just as, for almost a hundred years, pls. 4 and 9 in America Copy B fooled all who saw it, including myself, until their spuriousness was noticed for reasons other than the inaccuracy of the printed images by Joseph Viscomi and Thomas Lange. Caveat emptor!